Locate a flat bench and place a dumbbell to the long side of it (a little closer than midway to where the upper body will be). Lie on the bench with one side of the body down (if you're working the right shoulder, your left side will be on the bench; reverse for working the right side). Grab the dumbbell and lift it slightly off the floor with the hand of the shoulder being used. Keeping a slight bend at the elbow, lift the dumbbell up in an arcing motion (meaning up and away from the body, once it reaches midway, it will begin arcing up and towards the body). Inhale throughout this motion. Lift the dumbbell until the arm becomes perpendicular to the ground. Lower the dumbbell back down to the starting point. Do not let the dumbbell hit the floor and remember to exhale during this motion. Switch sides and repeat steps 4-6. To properly position the body on the bench may take a bit of practice due to the nature of the exercise. The main pressure points are on the hips and ribs which are not the most stable of structures due to their rounded anatomy. It is often advised to use the hand not lifting the dumbbell to grab the bench in order to stabilize the rest of the body. This exercise should not be performed with heavy weights. There are two reasons for this; the first is due to the balancing issue as described above. 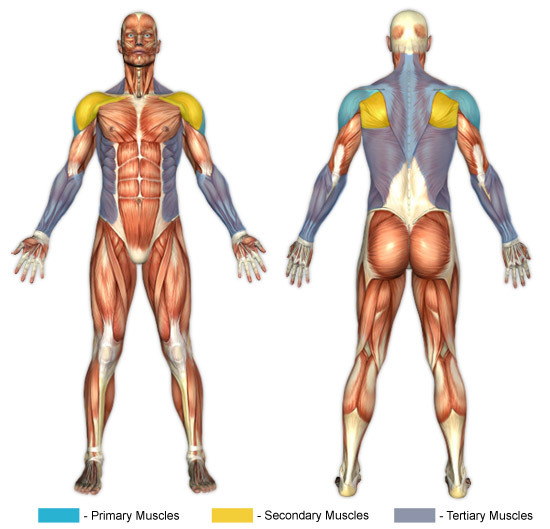 The second is because the rotator cuff muscles (teres minor, supraspinatus, infraspinatus) are involved. The moments just before the peak of this exercise can be particularly dangerous as this is when the most stress is placed on these muscles.